Are you curious about what the Office of Digital Learning is up to? As always, we provide our readers with a weekly blog series published on Tuesdays called This Week in ODL where the inquisitive mind can easily find updates on the projects, news, and developments underway at our office. We invite you to click here for a complete listing of our weekly updates. And don’t forget to check our Projects page where you can find descriptions and links to our work. This entry was posted in Midd Blogosphere and tagged community, digital environmentalism, digital language, digital learning, For Faculty, For Staff, Midd Points, MiddCreate, Office of Digital Learning, Portuguese on December 13, 2017 by Sonja Burrows. The Office of Digital Learning has recently begun a series on our blog about the newly-formed information environmentalism movement as an integral part of cultivating digital fluency. As Amy Collier writes in her post Attending to the Information Environment of the Web, “Misinformation on the web is polarizing us, it’s radicalizing us, and we should be paying attention.” Amy makes a call for higher education in general — and Middlebury in particular — to lead the way in improving our information ecosystem. To learn more about information environmentalism, and to join in, we invite you to begin by reading Amy’s post. 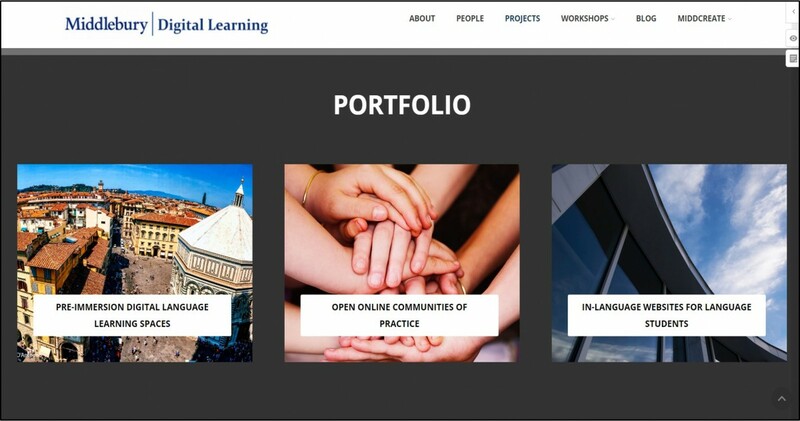 To learn more about other projects and initiatives supported by the Office of Digital Learning, we invite you to peruse This Week in ODL, a series on our blog where readers can find updates on the projects, news, and developments underway at our office. And don’t forget to check our Projects page where you can find descriptions of and links to our many projects. This entry was posted in Midd Blogosphere and tagged critical instructional design, digital learning, For Faculty, For Staff, Hindi, information environmentalism, Language, language learning, Midd Points, pre-immersion, School in India on November 29, 2017 by Sonja Burrows. Things are happening at the Office of Digital Learning! To keep abreast of what the ODL is up to, we invite you to read the weekly series on our blog called This Week in ODL where you can access updates on the projects, news, and developments underway at our office. We invite you to click here for a complete listing of our weekly updates. And don’t forget to check our frequently-updated Projects page, where you can find information about our many projects. This entry was posted in Midd Blogosphere and tagged data, digital environmentalism, digital learning, domain of one's own, For Faculty, For Staff, language teaching, Midd Points, MiddCreate, Office of Digital Learning, Social media, Spanish on November 15, 2017 by Sonja Burrows. Would you like to know more about the Office of Digital Learning and what we do? We invite you to read the weekly series on our blog called This Week in ODL where our readers can easily find updates on the projects, news, and developments at our office. Click here for a complete listing of our weekly updates. We also hope you will visit the Projects page on our website, where you can access a complete portfolio of the work we do. This entry was posted in Midd Blogosphere and tagged BOLD, digital language, digital learning, Midd News & Events, Midd Points, MiddCreate, Portuguese on November 2, 2017 by Sonja Burrows. Are you curious about what the Office of Digital Learning is up to? As always, we provide our readers with a weekly series on our blog called This Week in ODL where the inquisitive mind can easily find updates on the projects, news, and developments underway at our office. We invite you to click here for a complete listing of our weekly updates. And don’t forget to check our Projects page where you can find descriptions and links to our many projects. This entry was posted in Midd Blogosphere and tagged critical digital pedagogy, digital language, digital learning, digital sanctuary, For Faculty, For Staff, Hindi, language learning, Midd Points, scientific writing on October 18, 2017 by Sonja Burrows. This entry was posted in Midd Blogosphere and tagged critical digital pedagogy, digital learning, For Faculty, For Staff, Germany, Midd Points, Office of Digital Learning, Schools Abroad, Social media on October 3, 2017 by Sonja Burrows.